What Are Common Questions asked at a Bankruptcy 341 Meeting? 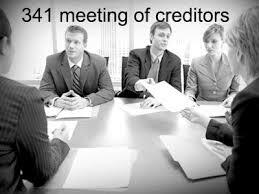 Washington State Bankruptcy clients often want to know what kinds of questions they will be asked at the required court meeting with the bankruptcy trustee which is called “the meeting of creditors”. The meeting usually takes place about 4 weeks after the bankruptcy case was filed. Usually a bankruptcy trustee will ask a debtor about their assets as well as the required questions below. ascertain why, and shall report the matter to the United States Trustee. documents before you signed them? varying the wording of the statements/questions, if the substance of the questions is covered. contained in the petition, schedules, statements, and related documents true and correct? Are there any errors or omissions to bring to my attention at this time? claimant’s address and telephone number, but do not state it on the record. 1 Pings/Trackbacks for "Common Questions asked at a Bankruptcy 341 Meeting"